Capstone Stud Time is a muesli syle breeding feed. It is a balanced complete high protein feed, featuring premium quality micronized grains and high quality protein sources, scientifically formulated to fulfil the nutritional requirements of broodmares, stallions and growing horses. 16% Protein: High quality protein to meet the requirements of growing and breeding horses. High quality protein sources: Includes Full Fat Soya, and Lysine for a quality amino acid profile. High in fat: Fat promotes coat shine and provides horses with a cool, safe energy source. Good balance of major minerals: Magnesium, Calcium and Phosphorous in balance and harmony to build strong bones and provide support for in-uterus foetus, foals, weanlings, yearlings and lactating mares. Balance of trace minerals and vitamins: Meets all the trace vitamin and mineral requirements of horses at stud. Muesli style feed: Palatable and ensures horses “clean up”. Live Yeast culture: Increases hindgut digestion of fibre feed sources. 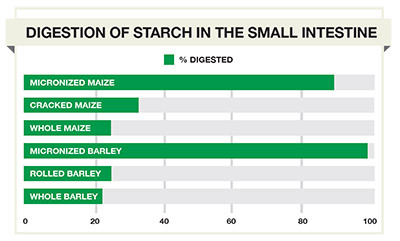 Lower starch, higher fat and fibre hence a lower glycemic index feed to reduce the risk of bone disorders in growing horses. Growing horses will require between 3kg (or 5 litres) to 5kg (or 8.5 litres) of Capstone Stud Time per day (see table below). Mares will require between 3kg (or 5 litres) and 7kg (or 12 litres) of Capstone Stud Time per day (see table below). The amount of Capstone Stud Time fed should be varied depending on the metabolism, forage quality and body condition of the horse. Capstone Stud Time should be fed in conjunction with a minimum of 1% of the horse’s bodyweight (5kg for a 500kg horse) of good quality roughage such as chaff or hay to provide a fibre source for optimal hindgut health. It is recommended not to feed more than 2.5kg (or 4.5 litres) of Capstone Stud Time per single feed. Because Capstone Stud Time is a highly digestible, high energy feed, care should be taken not to overfeed horses confined to stables or not receiving regular exercise. If young horses gain too much weight or suffer from Developmental Orthopaedic Disease, reduce the intake and seek further nutritional advice. 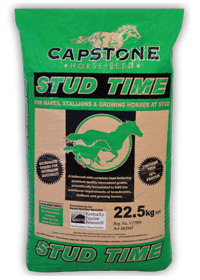 Introduce Capstone Stud Time to your horse’s diet gradually over a period of 4 to 7 days. Micronized Maize, Micronized Barley, Lupins, Oats (dressed and clipped), Canola Oil, Canola Meal, Full Fat Soya, Sunflower Seeds, Sunflower Meal, Lucerne, Wheaten Bran, Molasses, Salt, Feed Lime, Di Calphos, Chromium, Magnesium, Vitamin & Mineral Premix, Live Yeast, Lysine.